Commercial Safety College is pleased to offer Crane Operator training to our corporate customers. Please note: these training programs are not open to general enrollment. 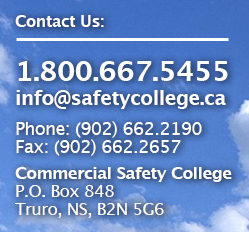 At Commercial Safety College, our goal is to provide your employees with the best training possible. We strive to ensure that an operator will be able to work both productively and safely upon completion of our training program. Whenever possible, we train your employees right on your work site. This brings familiarity to the equipment that they will actually be using. We are also pleased to offer Rigging Training.